This accessible guide to VAT provides clear and simple coverage, enabling both professionals and non-professionals confidently to grasp current VAT law. With a wealth of practical examples and written in non-technical English, this book is an ideal guide for tax advisers dealing with VAT, and small business proprietors. 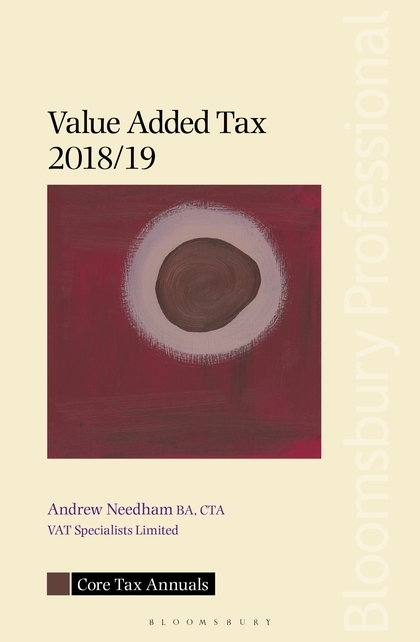 Value Added Tax 2018/19 concentrates on the rules and regulations you need to know, and highlights numerous planning points and common pitfalls. With relevant key tribunal and court decisions included, it will help to steer the reader through the latest VAT law. What you must know: Including an outline of the system, VAT groups and returns, registration, charge and supply issues, what is reduced and zero rated, exceptions, credit notes and record keeping. What you might need to know: Covers exports, imports, removals and acquisition of goods, partial exemption, Intrastat returns, partial exemption and the recovery of foreign VAT. Special situations: Includes information on joint ventures, second-hand goods and retail schemes, annual accounting, cash accounting, flat rates, assessment and VAT penalties. Chapter 6 So what must VAT be charged on? Chapter 9 So what is reduced-rated? Chapter 10 So what is zero-rated? Chapter 11 So what is exempt? Chapter 12 Is there one supply or two? Chapter 13 What can a business recover input tax on? Chapter 14 What is a valid tax invoice? Chapter 17 What records are required? Chapter 19 How does a business keep up to date on changes in VAT? Chapter 28 What is a business?